MONDAY 6 MARCH, 2017: New analysis by finance group Market Forces reveals Australia’s ‘big four’ provided almost $10 billion in finance to fossil fuels across the planet in 2016 – three and a half times the amount invested in clean energy. • By lending $1.35 billion to fossil fuels and $1.3 billion to renewables, NABs performance was the most creditable of the big four. ANZ, CommBank, NAB and Westpac have all publicly championed the two degree limit, each committing to support the transition to a low carbon economy. 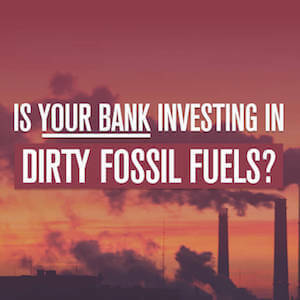 Despite this, all four banks breached their promises by once again funding projects which will expand the worldwide fossil fuel industry, including in Australia, India, Indonesia, Norway, PNG and the US. “It’s nonsense to suggest funding the expansion of the fossil fuel industry is compatible with a two degree world, yet that is exactly what the banks are expecting us to swallow,” said Market Forces Executive Director Julien Vincent. However, whilst gas and gas infrastructure feature prominently, lending for new coal projects has ground to a halt. In early 2016 even ANZ quietly withdrew from its position as coordinating bank on finance for the new, US$1.2 billion 1,200 megawatt ‘Song Hau 1’ power station, located near the highly sensitive Mekong Delta in Vietnam. “It seems the banks have belatedly got the picture that coal is no longer a viable funding proposition, both environmentally and economically,” said Vincent.